Terrific gluten-free recipe using the GF Bistro crust is at your fingertips now! I think we just died and went to “Pizza Heaven.” Take a look at these pictures, and you’ll see the kitchen at work testing The Gluten Free Bistro’s GF pizza crust. The taste of this crust is light in texture yet hearty and healthy. I don’t know how they did it, but it’s good! The whole grain vegan crust is artisan handmade, par baked and then frozen, packed on site. 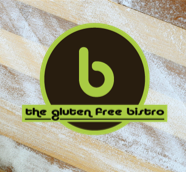 The Gluten Free Bistro currently supplies these pizza crusts to Boulder- and Denver-area restaurants, enabling celiacs and gluten-sensitive individuals to dine in comfort and safety at local restaurants. This company is a group effort involving three women with backgrounds in health, nutrition, and, as a result, food. Kelly, the only one to be diagnosed celiac after 15 years of severe symptoms, and her correct diagnosis changed her life. Their products (they also have GF fettuccini) are unique for the combined interest of these women in nutrition. Each product not only provides flavor but also vitamins, minerals, protein, and fiber. They aim to help the celiac rebuild after deficiencies through their healthy product line. The bistro’s flour blend is brown rice flour, buckwheat flour, sorghum flour, tapioca starch, organic coconut flour, and xanthan gum—in their proprietary blend, of course. As a side note, the package suggests taking the frozen crust and topping it with your own topping and popping it in the oven at 400 degrees for 15 minutes. We changed the recipe slightly since we’re not a restaurant, and we placed the frozen crust on the oven racks and pre-baked the crust slightly for about seven minutes at 400 degrees. Then we loaded it up and popped it back in the oven on the pizza clay stone for about 15 minutes. The time really depends on how high you load the pizza and what toppings you use. See our recipe, images and details. Giving this one a try for sure!